Gemstone Mining Camp, Northern Pakistan, 2015. The Karakoram is one of the great mountain ranges of the world. Wild, spectacular and remote, it is here that the gem miners of the Northern Pakistan have been coming to work for decades. These are some of the world’s highest altitude miners and they come in search of the planet’s most precious gemstones: aquamarine, rubies, emeralds, topaz, tourmaline, quartz, fluourite among many others. Gemstone miners are found throughout the Karakorum. The Range is a most spectacular place and has the highest concentration of mountains greater than 7000 metres to be found anywhere on the planet. Mining activity depends on where in the range the miners are working. In some locations, mining can only be undertaken between mid July and mid October after which falling temperatures, limited access to water, heavy snow and the risk of avalanche makes work too dangerous to continue. 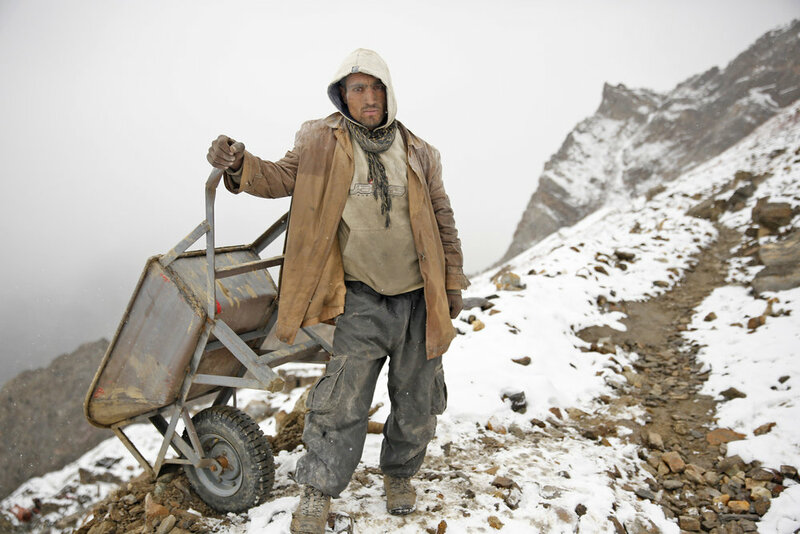 Mining in the Karakorum is dangerous, remote and difficult. Often, supplies including fuel, heavy drills, compressors and mechanical parts must be brought in by donkey from valleys more than 2000 vertical metres below and then carried up to the mines. There is no ready access to medical assistance in the event of accident or emergency. And being located in one of the most tectonically active areas on earth, rockfalls and landslides occur regularly. But notwithstanding these risks and challenges some of these gemfields have brought great wealth to the miners and their villages.